And even this piece isn't off the needles yet. 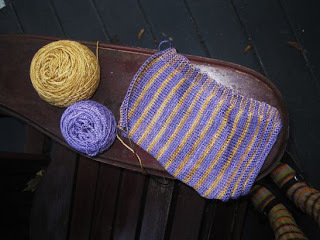 The Goal That Must Not Be Named was to have the lot onto its yoke by the end of last Sunday, so this should give you a pretty good idea of how limited my knitting time is these days. Something's gotta change, that's all there is to it. In only partially related news, I was over at Trish's house yesterday and congratulating her (yes, that's the word I'm going to use, never mind if my voice was a bit whiny) on having her baby gift done already while noting that there is another baby due for arrival in the vicinity in January for whom I will be very much remiss if I am not knitting something soon. And I am getting frankly a bit cardi phobic, so it isn't gonna be that. Trish's knit was a blanket, and she's done another for another baby (so many babies, I love it!) and she showed me both. I think I wanna do a blankie for the next baby. Sooooo much less stress about whether it will still fit when you hand it over! If I did lace, I think I'd do Anne Hanson's Cradle Me. But maybe colourblocks from Churchmouse Yarns would be good too. Or maybe I should just Stop Thinking and get on with my knitting. Have a good weekend everybody - and wish me luck for a productive one!